I should like to begin by expressing my deep gratitude for the honour to be invited to take part in this event of launching the new Encyclical of His Holiness Pope Francis’ Laudato Si’. I am also honoured by the fact that His All-Holiness, the Ecumenical Patriarch Bartholomew, has asked me to convey to you his personal joy and satisfaction for the issuing of the Encyclical. As some of you may already know, the Ecumenical Patriarchate has been the first one in the Christian world to draw the attention of the world community to the seriousness of the ecological problem and the duty of the Church to voice its concern and try to contribute with all the spiritual means at its disposal towards the protection of our natural environment. Thus, back already in the year 1989, Ecumenical Patriarch Dimitrios issued an Encyclical to the faithful Christians and to all people of good will, in which he underlined the seriousness of the ecological problem and its theological and spiritual dimensions. This was followed by a series of activities, such as international conferences of religious leaders and scientific experts, as well as seminars for young people, Church ministers etc. 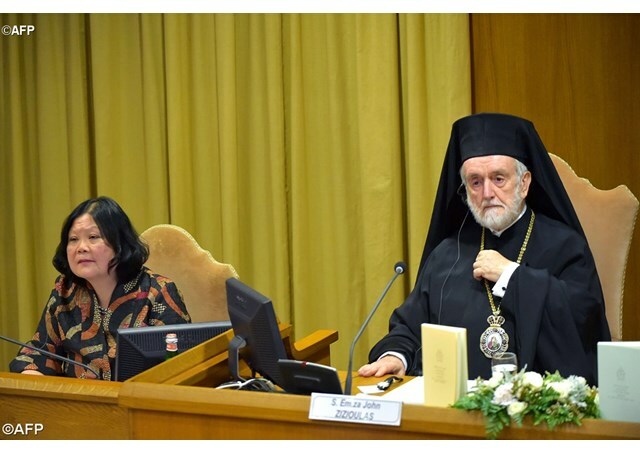 under the auspices of the present Ecumenical Patriarch Bartholomew, aiming at the promotion of an ecological consciousness among the Christians in particular and more widely in the community of men and women. The issuing of the Encyclical Laudato Si’ is, therefore, an occasion of great joy and satisfaction for the Orthodox. On behalf of them I should like to express our deep gratitude to His Holiness for raising his authoritative voice to draw the attention of the world to the urgent need to protect God’s creation from the damage we humans inflict on it with our behavior towards nature. This Encyclical comes at a critical moment in human history and will undoubtedly have a worldwide effect on people’s consciousness. 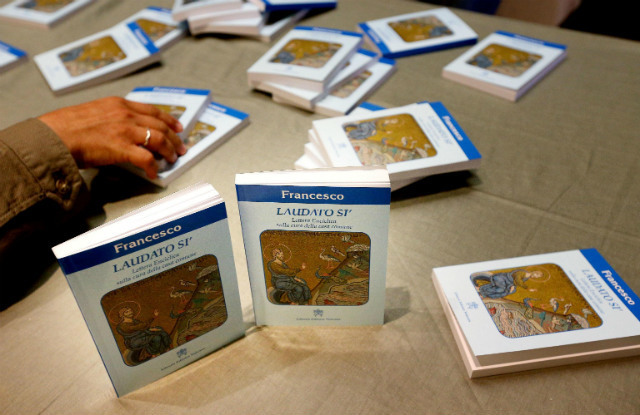 The ecumenical significance of the Encyclical. What does ecology have to do with theology? In the traditional manuals of theology, there is hardly any place for ecology and the same is true for the academic curricula of the theological schools, Catholic, Orthodox and Protestant. 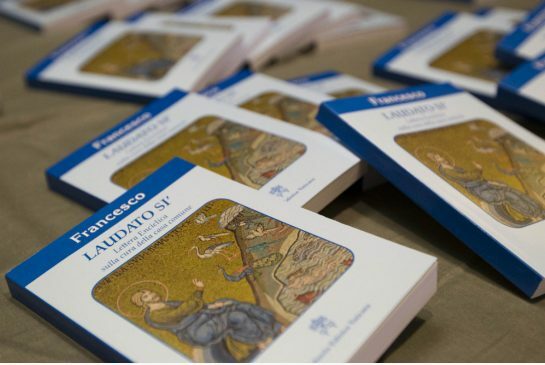 The Encyclical devotes a whole chapter (ch. 2) to show the profound ecological implications of the Christian doctrine of creation. It points out that according to the Bible “human life is grounded in three fundamental and closely intertwined relationships with God, with our neighbor and with the earth itself” (par. 66). This third relationship, i.e. with the earth, has been very often ignored by Christian theology to such an extent that the American historian Lynn White, in a now famous article in the periodical Scientist (1967), would accuse Christian theology for being responsible for the modern ecological crisis. For it is true that in Christian theology the human being has been so exalted above material creation as to allow humans to treat it as material for the satisfaction of their needs and desires. The human being has been de-naturalized and in its abuse and misuse of the biblical command to the first human couple – “increase and multiply and subdue the earth” (Gen. 1.28) – humanity was encouraged to exploit the material creation unrestrictedly with no respect for its integrity and even sacredness. This attitude to creation did not only lead to a misuse of the biblical doctrine but at the same time contradicted fundamental principles of Christian faith. One of them is the faith in the Incarnation of Christ. In assuming human nature, the Son of God took over material creation in its entirety. Christ came to save the whole creation through the Incarnation, not only humanity; for according to St. Paul (Rom. 8.23) “the whole creation groans in travail and is suffering” awaiting its salvation through humanity. The other fundamental principle of Christian faith that has important ecological implications relates to the very heart of the Church, which is the Holy Eucharist. In the celebration of the Eucharist, the Church offers to God the material world in the form of the bread and the wine. In this Sacrament space, time and matter are sanctified; they are lifted up to the Creator with thankfulness as His gifts to us; creation is solemnly declared as God’s gift, and human beings instead of proprietors of creation act as its priests, who lift it up to the holiness of the divine life. This brings to mind the moving words of St. Francis of Assisi with which the Encyclical opens: “Praise be to you, my Lord, through our Sister, Mother Earth.” As St. Gregory Palamas and other Greek Fathers would put it, the whole of creation is permeated by God’s presence through His divine energies; everything declares God’s glory, as the Psalmist says, and the human being leads this cosmic chorus of glorification to the Creator as the priest of creation. This way of understanding the place and mission of humanity in creation is common to both Eastern and Western Christian tradition, and is of particular importance for the cultivation of an ecological ethos. As it emerges clearly from the Encyclical, the ecological crisis is essentially a spiritual problem. The proper relationship between humanity and the earth or its natural environment has been broken with the Fall both outwardly and within us, and this rupture is sin. The Church must now introduce in its teaching about sin the sin against the environment, the ecological sin. Repentance must be extended to cover also the damage we do to nature both as individuals and as societies. This must be brought to the conscience of every Christian who cares for his or her salvation. The rupture of the proper relationship between humanity and nature is due to the rise of individualism in our culture. The pursuit of individual happiness has been made into an ideal in our time. Ecological sin is due to human greed which blinds men and women to the point of ignoring and disregarding the basic truth that the happiness of the individual depends on its relationship with the rest of human beings. There is a social dimension in ecology which the Encyclical brings out with clarity. The ecological crisis goes hand in hand with the spread of social injustice. We cannot face successfully the one without dealing with the other. Ecological sin is a sin not only against God but also against our neighbor. And it is a sin not only against the other of our own time but also – and this is serious – against the future generations. By destroying our planet in order to satisfy our greed for happiness, we bequeath to the future generations a world damaged beyond repair with all the negative consequences that this will have for their lives. We must act, therefore, responsibly towards our children and those who will succeed us in this life. All this calls for what we may describe as an ecological asceticism. It is noteworthy that the great figures of the Christian ascetical tradition were all sensitive towards the suffering of all creatures. The equivalent of a St. Francis of Assisi is abundantly present in the monastic tradition of the East. There are accounts of the lives of the desert saints which present the ascetic as weeping for the suffering or death of every creature and as leading a peaceful and friendly co-existence even with the beasts. This is not romanticism. It springs from a loving heart and the conviction that between the natural world and ourselves there is an organic unity and interdependence that makes us share a common fate just as we have the same Creator. Asceticism is an unpleasant idea in our present culture, which measures happiness and progress with the increase of capital and consumption. It would be unrealistic to expect our societies to adopt asceticism in the way St. Francis and the Desert Fathers of the East experienced it. But the spirit and the ethos of asceticism can and must be adopted if our planet is to survive. Restraint in the consumption of natural resources is a realistic attitude and ways must be found to put a limit to the immense waste of natural materials. Technology and science must devote their efforts to such a task. There is a great deal of inspiration and help that can be drawn from the Encyclical itself in this respect. at the expense of the poor of the earth. At this point I should like to mention that the Ecumenical Patriarchate decided as early as 1989 to devote the 1st of September of each year to praying for the environment. This date is according to the Orthodox liturgical calendar, going back to the Byzantine times, the first day of the ecclesiastical year. The liturgical service of the day includes prayers for creation and the Ecumenical Patriarchate commissioned a contemporary hymnographer from Mount Athos to compose special hymns for that day. 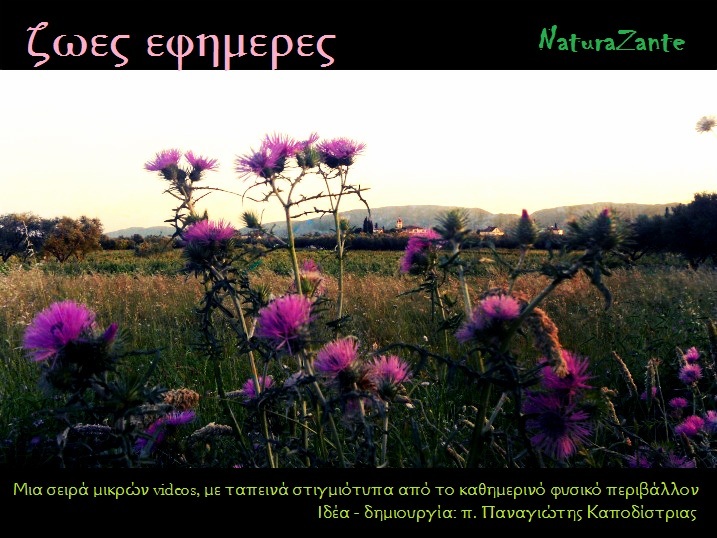 The 1st of September each year is now devoted by the Orthodox to the environment. Might this not become a date for such prayer for all Christians? This would mark a step towards further closeness among them. This brings me to my last comment on the Papal Encyclical, namely its ecumenical significance. There are in my view three dimensions to ecumenism. The first we may call ecumenism in time, an expression frequently used by one of the greatest Orthodox theologians of the last century, the late Fr. Georges Florovsky. By this we mean the effort of the divided Christians to unite on the basis of their common Tradition, the teaching of the Bible and the Church Fathers. 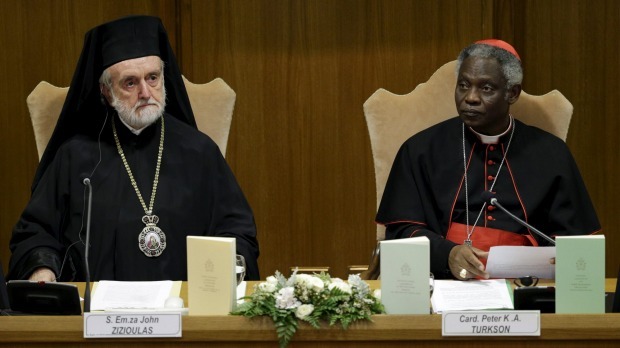 This is the object of the theological dialogues which are taking place in the Ecumenical Movement of our time and it seems to be the predominant form of ecumenism. 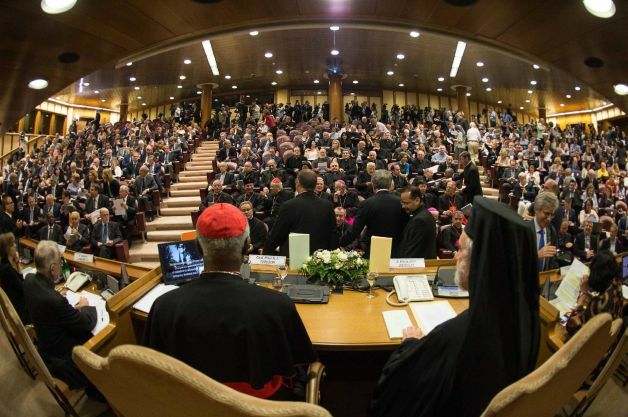 At the same time an ecumenism in space is also practiced through various international institutions, such as the World Council of Churches and similar ecumenical bodies which bring together the divided Christians so that the different cultural contexts in which they live may be taken into consideration in the search for unity. This has brought together Christians from Asia, America, Europe, Latin America etc – an expression of the universality of the Christian Church. To these two dimensions which have dominated the ecumenical scene for the last hundred years we must add, I think, a third one which is usually neglected, namely what I would call an existential ecumenism. By that I mean the effort to face together the most profound existential problems that preoccupy humanity in its entirety – not simply in particular places or classes of people. Ecology is without doubt the most obvious candidate in this case. 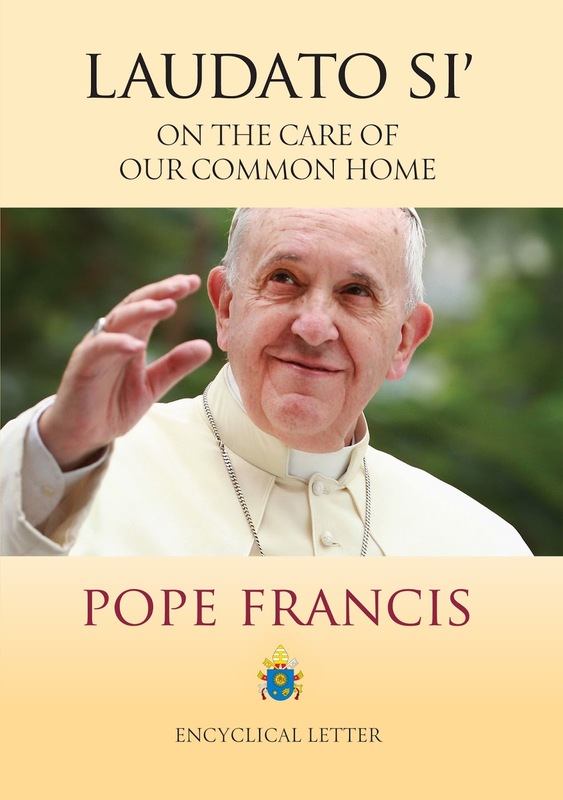 I believe that the significance of the Papal Encyclical Laudato Si’ is not limited to the subject of ecology as such. I see in it an important ecumenical dimension in that it brings the divided Christians before a common task which they must face together. We live at a time when fundamental existential problems overwhelm our traditional divisions and relativize them almost to the point of extinction. Look, for example, at what is happening today in the Middle East: do those who persecute the Christians ask them to which Church or Confession they belong? Christian unity in such cases is de facto realized by persecution and blood – an ecumenism of martyrdom. The threat posed to us by the ecological crisis similarly bypasses or transcends our traditional divisions. The danger facing our common home, the planet in which we live, is described in the Encyclical in a way leaving no doubt about the existential risk we are confronted with. This risk is common to all of us regardless of our ecclesiastical or confessional identities. Equally common must be our effort to prevent the catastrophic consequences of the present situation. Pope Francis’ Encyclical is a call to unity – unity in prayer for the environment, in the same Gospel of creation, in the conversion of our hearts and our lifestyles to respect and love everyone and everything given to us by God. We are thankful for that. Μετάφραση: Ιωάννης Λότσιος, Δρ. Θ.
Θα ήθελα να εκφράσω την βαθιά μου ευγνωμοσύνη για την τιμή να παραστώ στην δημοσιοποίηση της Νέας Εγκυκλίου της Αυτού Αγιότητας του Πάπα Φραγκίσκου «Laudato Si». Είμαι, επίσης ευγνώμων από το γεγονός ότι ο Παναγιώτατος Οικουμενικός Πατριάρχης κ. Βαρθολομαίος, μου ανέθεσε να μεταφέρω την προσωπική χαρά και ικανοποίηση του για την έκδοση της Εγκυκλίου. Όπως ορισμένοι από εσάς ίσως γνωρίζετε, το Οικουμενικό Πατριαρχείο, είναι το πρώτο στον Χριστιανικό κόσμο που έχει επιστήσει την προσοχή της Διεθνούς Κοινότητας στην σοβαρότητα του οικολογικού προβλήματος και την υποχρέωση της Εκκλησίας να εκφράσει την ανησυχία της και να καταβάλει προσπάθεια με όλα τα πνευματικά μέσα που έχει στην διάθεση της για την προστασία του φυσικού μας περιβάλλοντος. Έτσι, πριν από το έτος 1989, ο Οικουμενικός Πατριάρχης Δημήτριος εξέδωσε Εγκύκλιο προς τους πιστούς Χριστιανούς και σε όλους τους ανθρώπους καλής θέλησης, στην οποία υπογραμμίζει τη σοβαρότητα του οικολογικού προβλήματος και τις θεολογικές και πνευματικές διαστάσεις του. Αυτό ακολούθησε μια σειρά από δραστηριότητες, όπως Διεθνείς Διασκέψεις Θρησκευτικών Ηγετών και επιστημόνων εμπειρογνωμόνων, καθώς και σεμινάρια για νέους κληρικούς της Εκκλησίας κ.λ.π., υπό την αιγίδα του Οικουμενικού Πατριάρχη Βαρθολομαίου, με στόχο την προώθηση της οικολογικής συνείδησης μεταξύ των Χριστιανών, όσο και ευρύτερα στην κοινωνία ανδρών και γυναικών. 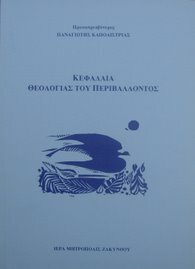 Η έκδοση της Εγκυκλίου «Laudato Si» είναι, επομένως, μια ευκαιρία μεγάλης χαράς και ικανοποιήσεως για τους Ορθοδόξους. Για αυτούς, θα ήθελα να εκφράσω την βαθιά μου ευγνωμοσύνη μας προς την Αυτού Αγιότητα να επιστήσει την προσοχή του κόσμου με την υπεύθυνη φωνή του για την επείγουσα ανάγκη προστασίας της δημιουργίας του Θεού από την ζημία που εμείς οι άνθρωποι προκαλούμε σε αυτό, με την συμπεριφορά μας απέναντι στη φύση. Αυτή η Εγκύκλιος έρχεται σε μια κρίσιμη στιγμή στην ιστορία της ανθρωπότητας και θα έχει αναμφίβολα μια παγκόσμια επίδραση στην συνείδηση των ανθρώπων. Εκείνοι που θα διαβάζουν την Εγκύκλιο θα εντυπωσιαστούν από το βάθος και την επιμέλεια με την οποία το οικολογικό πρόβλημα αντιμετωπίζεται και την σοβαρότητα που δείχνει προς τα έξω, μαζί με συγκεκριμένες εισηγήσεις και προτάσεις για το πώς πρέπει να δράσουν και να αντιμετωπίσουν τις συνέπειες της. Υπάρχει στις σελίδες της αρκετή τροφή για σκέψη για όλους: τον επιστήμονα, τον οικολόγο, τον κοινωνιολόγο και πάνω από όλα τους πιστούς της Εκκλησίας. Ο δικός μου σχολιασμός θα περιοριστεί στον πλούτο της θεολογικής σκέψης και πνευματικότητας της Εγκυκλίου. Ο χρόνος και ο χώρος δεν μου επιτρέπουν να κάνω μια πλήρη ανάλυση για τις αναφορές αυτών των θεμάτων. • Και στην Οικουμενική σημασία της Εγκυκλίου. Τι σχέση έχει η οικολογία με τη θεολογία; Στα παραδοσιακά εγχειρίδια της Θεολογίας, δεν υπάρχει σχεδόν καθόλου χώρος για την οικολογία και το ίδιο ισχύει και για το Ακαδημαϊκό Πρόγραμμα Σπουδών των Θεολογικών Σχολών, Καθολικών, Ορθοδόξων και Προτεσταντικών. Η Εγκύκλιος αφιερώνει ένα ολόκληρο κεφάλαιο (κεφ. 2) για να δείξει τις βαθιές οικολογικές επιπτώσεις του χριστιανικού δόγματος της δημιουργίας. Επισημαίνει ότι, σύμφωνα με την Αγία Γραφή «η ανθρώπινη ζωή είναι θεμελιωμένη σε τρεις βασικές και στενά συνυφασμένες σχέσεις: με το Θεό, την γειτονική χώρα και με την ίδια τη γη» (§ 66). Η τρίτη αυτή σχέση, δηλαδή με τη γη, έχει πολύ συχνά αγνοηθεί από την χριστιανική Θεολογία σε τέτοιο βαθμό, ώστε ο Αμερικανός ιστορικός Lynn White, σε ένα δημοφιλές άρθρο του στο περιοδικό Scientist (1967), θα κατηγορήσει την Χριστιανική Θεολογία για την αδιαφορία για την σύγχρονη οικολογική κρίση. Διότι είναι αλήθεια ότι στη Χριστιανική Θεολογία το ανθρώπινο ον ως κορωνίδα της υλικής δημιουργίας, επιτρέπει στους ανθρώπους να την αντιμετωπίσουν ως μέσο για την ικανοποίηση των αναγκών και των επιθυμιών τους. Το ανθρώπινο ον έχει λησμονήσει και έχει καταχραστεί την βιβλική εντολή προς το πρώτο ανθρώπινο ζευγάρι – «αὐξάνεσθε καὶ πληθύνεσθε καὶ πληρώσατε τὴν γῆν καὶ κατακυριεύσατε αὐτῆς» (Γεν. 1,28) – η ανθρωπότητα ενθαρρύνεται να αξιοποιήσει το υλικό της δημιουργίας απεριόριστα με κανένα σεβασμό για την ακεραιότητά της και ακόμη και την ιερότητά της. Αυτή η στάση για τη δημιουργία δεν οδηγεί μόνο σε κατάχρηση του βιβλικού δόγματος, αλλά την ίδια στιγμή έρχεται σε αντίθεση με τις θεμελιώδεις αρχές της χριστιανικής πίστης. Μια από αυτές είναι η πίστη στην Ενανθρώπηση του Χριστού. Αναλαμβάνοντας την ανθρώπινη φύση, ο Υιός του Θεού ανέλαβε την υλική δημιουργία, στο σύνολο της. Ο Χριστός ήρθε να σώσει ολόκληρη την κτίση μέσα από την ενσάρκωση, όχι μόνο την ανθρωπότητα! Γιατί σύμφωνα με τον Άγιο Παύλο (Προς Ρωμαίους, 8, 23) «πᾶσα ἡ κτίσις συστενάζει καὶ συνωδίνει ἄχρι τοῦ νῦν», περιμένει τη σωτηρία της μέσα από την ανθρωπότητα. Η άλλη βασική αρχή της χριστιανικής πίστης που έχει σημαντικές οικολογικές επιπτώσεις σχετίζεται με την ίδια την καρδιά της Εκκλησίας, η οποία είναι η Θεία Ευχαριστία. Στην τέλεση της Ευχαριστίας, η Εκκλησία προσφέρει στον Θεό τον υλικό κόσμο, με την μορφή του Άρτου και του Οίνου. Σε αυτό το Μυστήριο, χώρος, χρόνος και ύλη αγιάζονται! Έχουν προσφερθεί στον Δημιουργό με ευγνωμοσύνη ως δώρα του σε εμάς! Η δημιουργία επίσημα δηλώνεται ως δώρο του Θεού, και τα ανθρώπινα όντα, ιδιοκτήτες της πράξεως της δημιουργίας ως ιερείς, που θα σηκώσουν την αγιότητα της θείας ζωής. Αυτό φέρνει στο νου τα λόγια προσευχής του Αγίου Φραγκίσκου της Ασίζης με τα οποία ανοίγει η Εγκύκλιος: «Δόξα σοι Κύριε, δια της αδελφής μας, Μητέρας Γης». Όπως ο Άγιος Γρηγόριος ο Παλαμάς και άλλοι Έλληνες Πατέρες, θέτουν, την διαπνοή της παρουσίας του Θεού στη δημιουργία μέσα από τις Θείες Ενέργειες Του! Ότι, δηλώνει η δόξα του Θεού, κατά τον ψαλμωδό, και ο άνθρωπος οδηγεί τον κοσμικό χορό της δοξολογίας στον Δημιουργό ως ιεράς της δημιουργίας. Με αυτόν τον τρόπο κατανόησης του τόπου και της αποστολής της ανθρωπότητας στη δημιουργία, είναι κοινή τόσο για την Ανατολή όσο και για την Δυτική χριστιανική παράδοση και έχει ιδιαίτερη σημασία για την καλλιέργεια ενός οικολογικού ήθους. Όπως σαφέστερα προκύπτει από την Εγκύκλιο, η οικολογική κρίση είναι ουσιαστικά ένα πνευματικό πρόβλημα. Η σωστή σχέση μεταξύ της ανθρωπότητας και της γης ή το φυσικό περιβάλλον της έχει κομματιαστεί με την πτώση τόσο προς τα έξω, όσο και εσωτερικά σε εμάς, και αυτή η ρήξη είναι η αμαρτία. Η εκκλησία πρέπει τώρα να εισαγάγει στην διδασκαλία της την αμαρτία για το φυσικό περιβάλλον, την οικολογική αμαρτία. Η μετάνοια πρέπει να επεκταθεί για να καλύψει τις ζημιές που κάνουμε στην φύση, τόσο ως άτομα, όσο και ως κοινωνίες. Αυτό πρέπει να φέρει στην συνείδηση του κάθε Χριστιανός που ενδιαφέρεται για την σωτηρία του. Η ρήξη της σωστής σχέσης ανάμεσα στην ανθρωπότητα και την φύση οφείλεται στην άνοδο του ατομισμού στον πολιτισμό μας. Η επιδίωξη της ατομικής ευτυχίας έχει γίνει ένα ιδανικό της εποχής μας. Η οικολογική αμαρτία οφείλεται στην ανθρώπινη απληστία που τυφλώνει τους άνδρες και τις γυναίκες μέχρι του σημείου να αγνοήσουν και να παραγκωνίσουν την βασική αλήθεια ότι η ευτυχία του ατόμου εξαρτάται από την σχέση της με τα υπόλοιπα ανθρώπινα όντα. Υπάρχει μια κοινωνική διάσταση στην οικολογία που φέρνει η Εγκύκλιος με σαφήνεια. Η οικολογική κρίση πηγαίνει χέρι-χέρι με την εξάπλωση της κοινωνικής αδικίας. Δεν μπορούμε να αντιμετωπίσουμε με επιτυχία το ένα χωρίς να ασχολούμαστε με το άλλο. Η οικολογική αμαρτία είναι αμαρτία, όχι μόνο κατά του θεού, αλλά και εναντίον του πλησίον μας. Και είναι αμαρτία, όχι μόνο του άλλου, αλλά και του δικού μας χρόνου, αλλά και – και αυτό είναι σοβαρό- έναντι των μελλοντικών γενεών. Με την καταστροφή του πλανήτη μας, για να ικανοποιήσουμε την απληστία μας για την ευτυχία, θα κληροδοτήσουμε στις επόμενες γενεές, έναν κόσμο που έχει καταστραφεί ανεπανόρθωτα, με όλες τις αρνητικές συνέπειες που θα έχει για την ζωή τους. Πρέπει να δράσουμε, ως εκ τούτου, με υπευθυνότητα απέναντι στα παιδιά μας και τις γενεές που θα έρθουν σε αυτή την ζωή. Όλα αυτά μας καλούν για το τι μπορούμε να περιγράψουμε ως ένα οικολογικό ασκητισμό. Αξίζει να σημειωθεί ότι οι μεγάλες μορφές της χριστιανικής ασκητικής παράδοσης, είχαν ευαισθησία στα βάσανα όλων των πλασμάτων. Το ισοδύναμο του Αγίου Φραγκίσκου της Ασίζης, είναι άφθονο στην μοναστική παράδοση της Ανατολής. Υπάρχουν στοιχεία από την ζωή των αγίων της ερήμου που παρουσιάζουν την ασκητική, που κλαίουν και οδύρονται για τον πόνο και τον θάνατο του κάθε πλάσματος, και οδηγούν σε μια ειρηνική και φιλική συνύπαρξη, ακόμη και με τα θηρία. Αυτό δεν είναι ρομαντισμός. Πηγάζει από την καρδιά που αγαπά και την πεποίθηση ότι ανάμεσα στον φυσικό κόσμο και τον εαυτό μας, υπάρχει μια οργανική ενότητα, που αλληλοεξαρτάται και μας κάνει να μοιραζόμαστε μια κοινή μοίρα, ακριβώς όπως έχουμε με τον ίδιο τον Δημιουργό. Ο ασκητισμός είναι μια δυσάρεστη ιδέα στην σημερινή κουλτούρα μας, η οποία μετρά την ευτυχία και την πρόοδο με την αύξηση του κεφαλαίου και της κατανάλωσης. Δεν θα ήταν ρεαλιστικό να αναμένουν οι κοινωνίες μας να υιοθετήσουν τον ασκητισμό με τον τρόπο του Αγίου Φραγκίσκου και των Πατέρων της Ερήμου της Ανατολής που έχουν βιώσει. Αλλά το πνεύμα και το ήθος του ασκητισμού μπορεί και πρέπει να υιοθετηθεί, αν ο πλανήτης μας πρέπει να επιβιώσει. Αυτοσυγκράτηση στην κατανάλωση των φυσικών πόρων είναι μια ρεαλιστική στάση και πρέπει να βρεθούν τρόποι για να τεθεί ένα όριο στην τεράστια σπατάλη των φυσικών υλικών. Η τεχνολογία και η Επιστήμη πρέπει να αφιερώσει τις προσπάθειες τους για ένα τέτοιο έργο. Υπάρχει μια μεγάλη έμπνευση και βοήθεια που μπορούν να αντλήσουν από την ίδια την Εγκύκλιο, από αυτήν την άποψη. όχι την ρύπανση και την καταστροφή. Αγγίζει τις καρδιές, των ατόμων που αναζητούν το κέρδος, σε βάρος των φτωχών της γης. όπως το ταξίδι μας προς την κατεύθυνση του απείρου φωτός. Σε αυτό το σημείο θα ήθελα να αναφέρω ότι το Οικουμενικό Πατριαρχείο αποφάσισε, ήδη το 1989, να αφιερώσει την 1ην Σεπτεμβρίου κάθε έτους για την προσευχή για το περιβάλλον. Η ημερομηνία αυτή σύμφωνα με το λειτουργικό ημερολόγιο της Ορθόδοξης Εκκλησίας, μας πηγαίνει πίσω στα βυζαντινά χρόνια, στην πρώτη ημέρα του εκκλησιαστικού έτους. Η λειτουργική αναφορά της ημέρας περιλαμβάνει προσευχές για την δημιουργία και το Οικουμενικό Πατριαρχείο, ανέθεσε σε σύγχρονο υμνογράφο από το Άγιο Όρος, να συνθέσει ορισμένους ύμνους για εκείνη τη ημέρα. Η 1η Σεπτεμβρίου κάθε έτους είναι αφιερωμένη από τότε για τους Ορθοδόξους για το περιβάλλον. Μήπως αυτή δεν είναι μια ημερομηνία για μια τέτοια προσευχή για όλους τους Χριστιανούς; Αυτό θα σηματοδοτήσει ένα περαιτέρω βήμα για την εγγύτητα μεταξύ τους. Αυτό με φέρνει στο τελευταίο μου σχόλιο σχετικά με την Παπική Εγκύκλιο, δηλαδή την οικουμενική σημασία της. Υπάρχουν κατά τη γνώμη μου τρεις διαστάσεις για τον οικουμενισμό. Ο οικουμενισμός, που μπορούμε πρώτα να αποκαλέσουμε οικουμενισμό στον χρόνο, μια έκφραση που πολύ συχνά χρησιμοποιεί ένα από τους μεγαλύτερους ορθόδοξους θεολόγους του περασμένου αιώνα, ο αείμνηστος π. Γεώργιος Φλωρόφσκυ. Με το όρο αυτό εννοούμε την προσπάθεια των διηρημένων Χριστιανών να ενωθούν στην βάση των κοινών τους σημείων, της παράδοσης, της διδασκαλίας της Αγίας Γραφής και των Πατέρων της Εκκλησίας. Αυτό είναι το αντικείμενο των θεολογικών διαλόγων που λαμβάνουν χώρα στην Οικουμενική Κίνηση της εποχής μας και φαίνεται να είναι η κυρίαρχη μορφή του οικουμενισμού. Την ίδια στιγμή, ένας οικουμενισμός στο χώρο ασκείται επίσης μέσω διάφορων Διεθνών Οργανισμών, όπως το Παγκόσμιο Συμβούλιο των Εκκλησιών και παρόμοιων οικουμενικών φορέων, όπου συγκεντρώνονται οι διηρημένοι Χριστιανοί, έτσι ώστε τα διαφορετικά πολιτισμικά πλαίσια στα οποία ζουν, να λαμβάνονται υπόψη κατά την αναζήτηση της ενότητας. Αυτό έφερε κοντά Χριστιανούς από την Ασία, την Αμερική, την Ευρώπη, την Λατινική Αμερική κ.λ.π., που είναι μια έκφραση της καθολικότητας της Χριστιανικής Εκκλησίας. Σε αυτές τις δύο διαστάσεις που έχουν κυριαρχήσει στην οικουμενική σκηνή τα τελευταία εκατό χρόνια θα πρέπει να προσθέσουμε, νομίζω, μια τρίτη, η οποία συνήθως παραμελείται, δηλαδή αυτό που θα αποκαλούσα υπαρξιακό οικουμενισμό. Με τον όρο αυτό εννοώ την προσπάθεια να αντιμετωπίσουμε μαζί τα πιο βαθιά υπαρξιακά προβλήματα που απασχολούν την ανθρωπότητα στο σύνολο της – όχι μόνο σε συγκεκριμένα μέρη ή κατηγορίες ανθρώπων. Η οικολογία είναι χωρίς αμφιβολία η πιο προφανής υποψήφια στην προκειμένη περίπτωση. Πιστεύω ότι η σημασία της Παπικής Εγκυκλίου «Laudato Si» δεν περιορίζεται στο θέμα της οικολογίας. Βλέπω σε αυτήν μια σημαντική οικουμενική διάσταση που φέρει τους διηρημένους Χριστιανούς σε ένα κοινό έργο που πρέπει να αντιμετωπίσουν. Ζούμε σε μια εποχή όπου τα θεμελιώδη υπαρξιακά προβλήματα κατακλύζουν τις παραδοσιακές διαιρέσεις και σχέσεις μας, που φτάσουν στο σημείο της εξαφάνισης. Κοιτάξτε, για παράδειγμα, τι συμβαίνει σήμερα στη Μέση Ανατολή: σκοτώνουν τους χριστιανούς, ανεξάρτητα σε ποια Εκκλησία ή Ομολογία και εάν ανήκουν. Η Χριστιανική ενότητα σε αυτές τις περιπτώσεις εκ των πραγμάτων αναδύεται από τις διώξεις και το μαρτύριο του αίματος, που είναι ένας οικουμενισμός του μαρτυρίου. Η απειλή που τίθεται σε εμάς από την οικολογική κρίση, παρακάμπτει και αυτή ή υπερβαίνει τις παραδοσιακές διαιρέσεις μας. Ο κίνδυνος που αντιμετωπίζει ο κοινός μας οίκος, πλανήτης στον οποίο ζούμε, περιγράφεται στην Εγκύκλιο με ένα τρόπο που είναι κοινός για όλους μας, ανεξάρτητα από την εκκλησιαστική ή θρησκευτική ταυτότητα μας. Εξίσου κοινή πρέπει να είναι και η προσπάθεια μας να αποτρέψει τις καταστροφικές συνέπειες της παρούσας κατάστασης. Η Εγκύκλιος του Πάπα Φραγκίσκου, είναι κάλεσμα για ενότητα-ενότητα στην προσευχή για το περιβάλλον, με το ίδιο Ευαγγέλιο της δημιουργίας, στην αλλαγή της καρδιά μας και τον τρόπο ζωή μας, να σέβονται και να αγαπούν τους πάντες και τα πάντα που μας δόθηκαν από το θεό. Είμαστε ευγνώμονες γι' αυτό.